Which platform is best for your e-commerce website development. 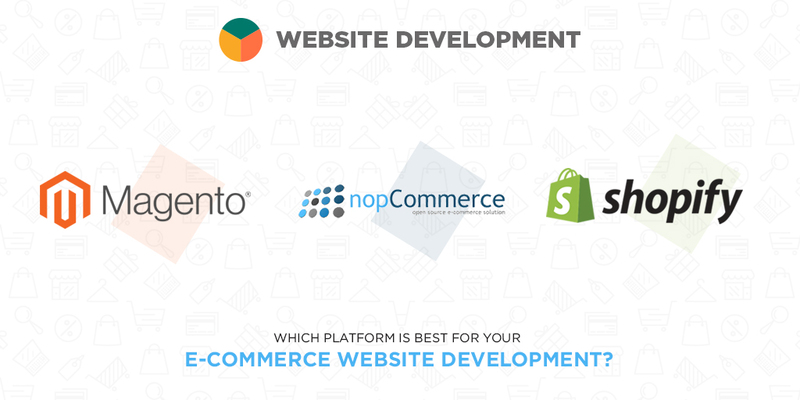 HomeEcommerceMagento, nopCommerce or Shopify: Which platform is best for your e-commerce website development? iOS or Android App development: Which platform should startups choose? Magento, nopCommerce or Shopify: Which platform is best for your e-commerce website development? Choosing the right platform for your e-commerce website is indeed a complex task, and the reasons are mainly two; firstly with hundreds of pre-built platforms available in this huge eCommerce platform market, it is obviously befuddling for a businessman to choose. Further, the rising competition in commerce realm also puts you in that pressure that you not doing anything wrong here. So, before you start this journey of choosing the platform for your e-business, ask the following questions to yourself. What is your product type? Is it digital goods or physical goods because the difference comes in terms of shipping costs and etc. Therefore look for a platform which suits your product type. What size of the stock you want to maintain because every platform has a different offering in this regard. What payment method you would want because there are alternative payment options which are offered by sites. Whether you want a self-hosted version of your store or a hosted solution from them? Lastly, what is your budget? After this, you will be halfway clear. Now you only need to evaluate the features of available options. Here, we have jotted down some notable features off best three platforms for you. With over 3,25,000 websites built on it, it is indeed a leading and reliable online platform. This hosted shopping platform is perfect to build complex still easy to use online stores. The simple tools, easy theme editing, beautifully designed business templates, drag and drop interface and super user-friendly mechanism ensures a seamless experience. The real advantage of this platform is its 24/7 responsive customer support to its users. Be sure of getting your issue sort in case anything happens. It also helps to maintain your site in good shape through different guides and tuts available on the website. Shopify offers 14-day free trial after that you need to buy a monthly subscription. This open-source solution is presently the most flexible eCommerce platform. It supports multiple currencies, tax rates per location, product type, customer group and different payment systems. The highlight of this platform is it’s out of the box SEO settings. It offers meta tags for products and home page, canonical tags for categories and products, edits of robot.txt files, image optimisation and etc. It is not as user-friendly as Shopify so if you zero-down it, be prepared to spend more time on learning the basics of this platform. This open source commerce framework is powerful enough to let you create any workflow that you require. The main aspect of it is that it allows you to deploy and manage multiple fronted stores from one place only. This way you can create stores separately for B2B and B2C sales. It is integrated with more than 50 payment gateways and support multi-currency checkout. Our suggestion, if you have no coding experience and want to create a single limited niche web store then opt for Shopify. Go for Magento, if your budget allows you to hire a Magento developer and want to create a medium-sized online store catering to your country or region only. If you plan to build a huge business with multiple stores and customised logics then choose nopCommerce. Joomla or Magento – Which is a better E-commerce Solution? The Future of E-Commerce: Unpredictable But Revolutionary! Is E-Commerce The Death of Retail?